Extended-spectrum beta-lactamase (ESBL) in Enterobacteriaceae is becoming more prevalent in the United States. Microculture Inc. screens for ESBL using the new HardyCHROM chromogenic selective medium (Hardy Diagnostics. www.HardyDiagnostics.com ) for primary screenings. 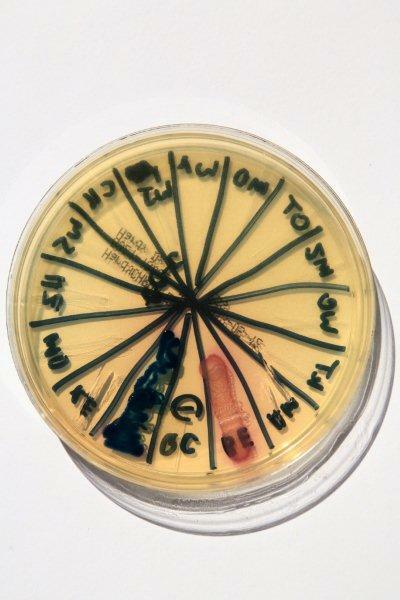 Certain klebsiella species, Escherichia coli ( E. coli) and Proteus mirabilis strains carrying the genes for resistance show up as colored colonies on this medium. Non-ESBL microbes are inhibited on this medium. The beta lactam concentration in the bladder is very high and may overcome hydrolysis by ESBL enzymes. J Hindler Antimicrobial Susceptibility Testing: Optimizing Use of 2005 CLSI Standards. 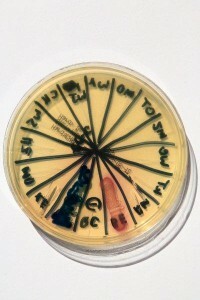 The following photograph gives an example of the growth of E. coli (red colonies) and klebsiella (blue colonies) on ESBL medium. 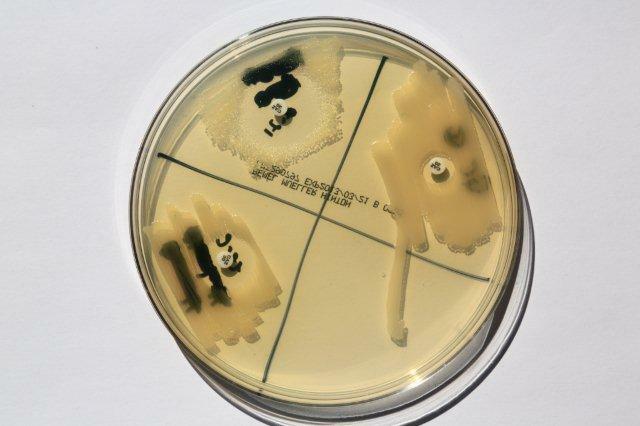 The figure below shows susceptibility with ceftazidime discs of ESBL Klebsiella (on right) and non-ESBL Klebsiella (on left). Without the use of HardyChrom medium, ESBL positive cultures may have erroneously been reported as sensitive to ceftazidime.